Northerlies… Creme de Violette (FA) and Umbrella Falls. | Great Escape. Nick Bullock. The opening spread from Ian Parnell’s superb Alpinist Article. Bruised Violet in yellow and Crème de Violette in red. Credit Ian Parnell. 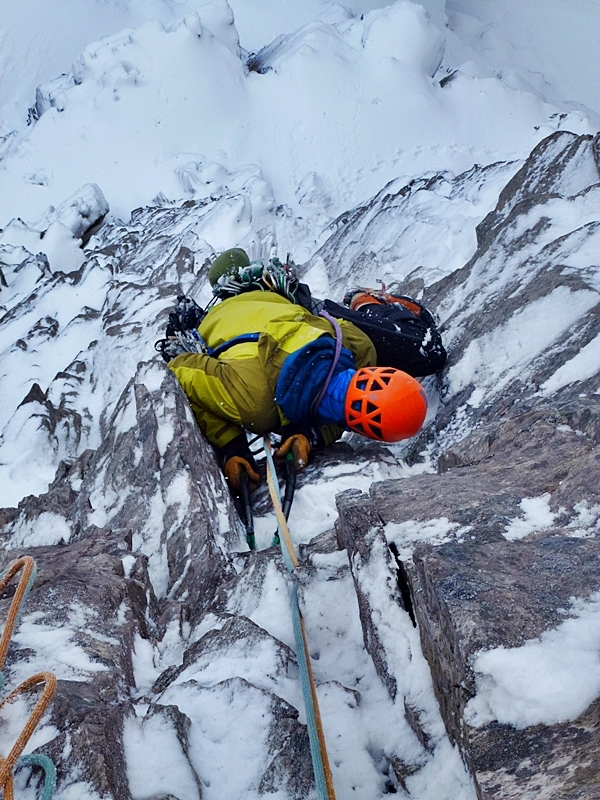 Seeing the pictures in Alpinist Magazine, the angles, the steepness, the flakes and cracks and then reading the account of Ian Parnell climbing the first ascent of Bruised violet, I have always wanted to share his experience. 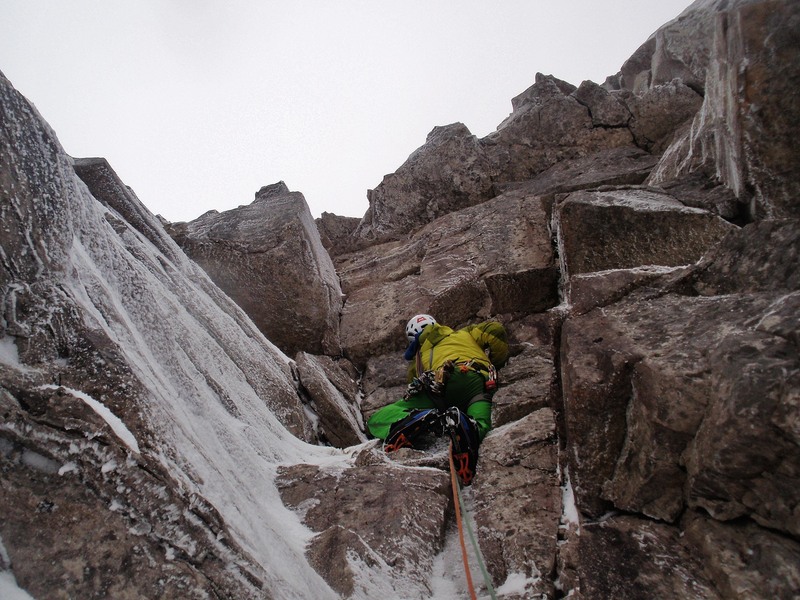 The West Central Gully on Beinn Eighe is such an atmospheric place – the lines are striking. History drips from the steep walls. Even the name Bruised Violet is fitting and evocative. 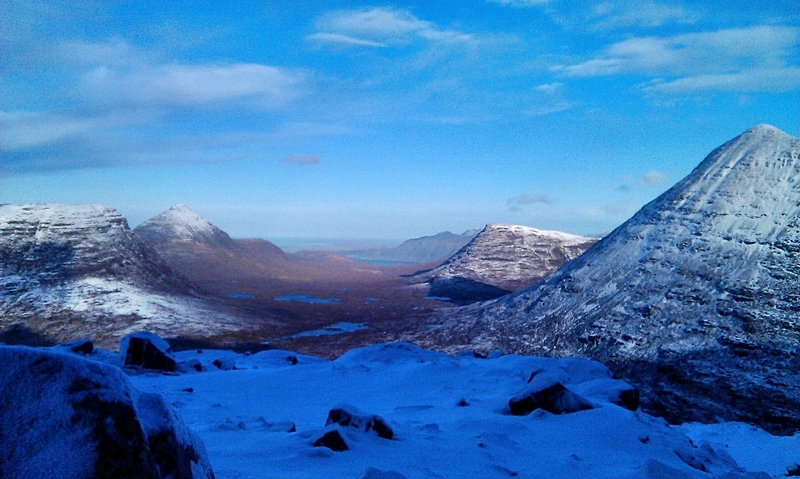 On Friday afternoon, Tim Neill and I stood at the top of the crag with wide smiles watching the sun dip and looking at the Torridon mountains – ancient white-hat wearing sentries. 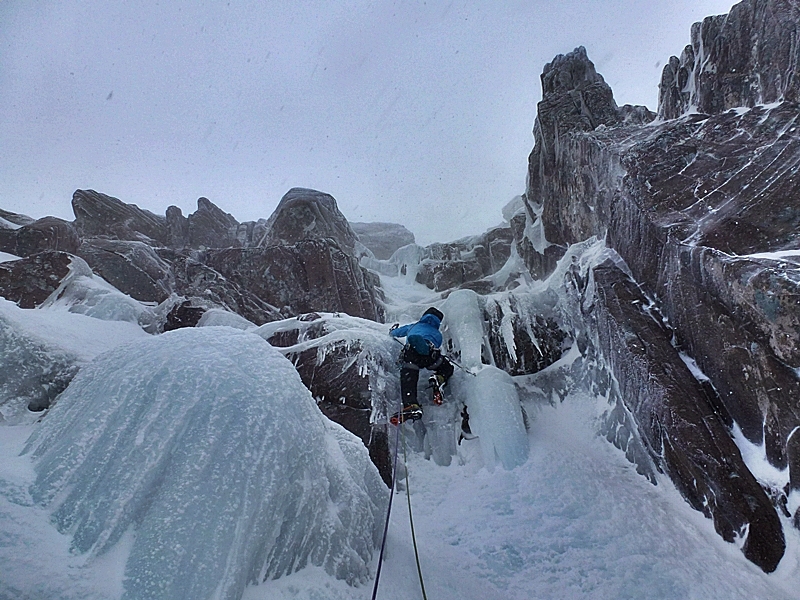 The route we had just climbed had been one of the most sustained and fulfilling outings ever. Well done Ian for putting that one up I said, enthusing to Tim, but I’m not very good at following complex descriptions and the line had appeared a tad undergraded. 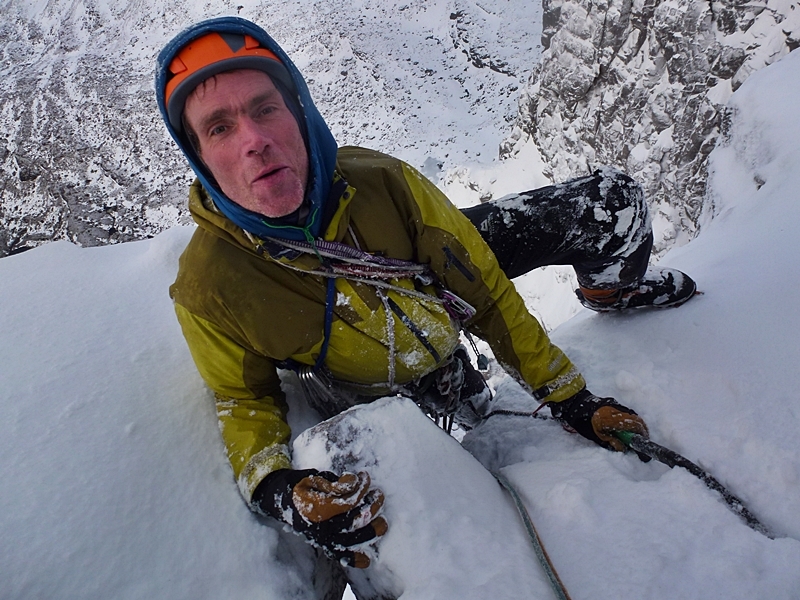 I texted Ian as we drove back to Roy Bridge and said Bruised Violet was one of the best routes I had ever climbed in Scotland, top five for sure… “Ian must have been going well at the time of climbing Bruised Violet,” I said to Tim and continued, “I would have graded it 9 for technical climbing and maybe IX for the overall grade.” I continued, that I thought the route we had just climbed was better than Blood Sweat and Frozen Tears, the four star outing to the left. Don’t get me wrong, I think BS&FT is a great route, I just thought this route was better and harder and more sustained. 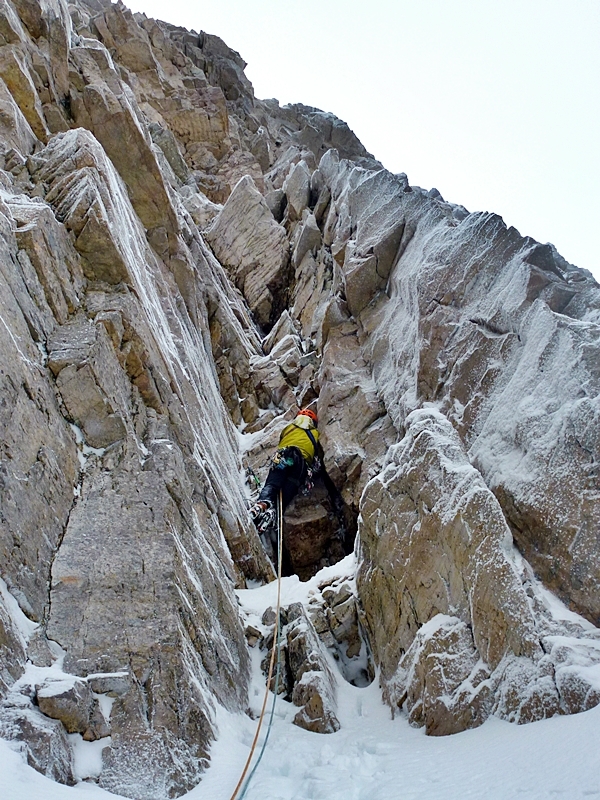 Run-out – a steep groove above a roof, about 15 to 20 feet above a bulldog placed in ice while tentatively pulling one tooth pick placements and balancing on tiny footholds focuses the mind. 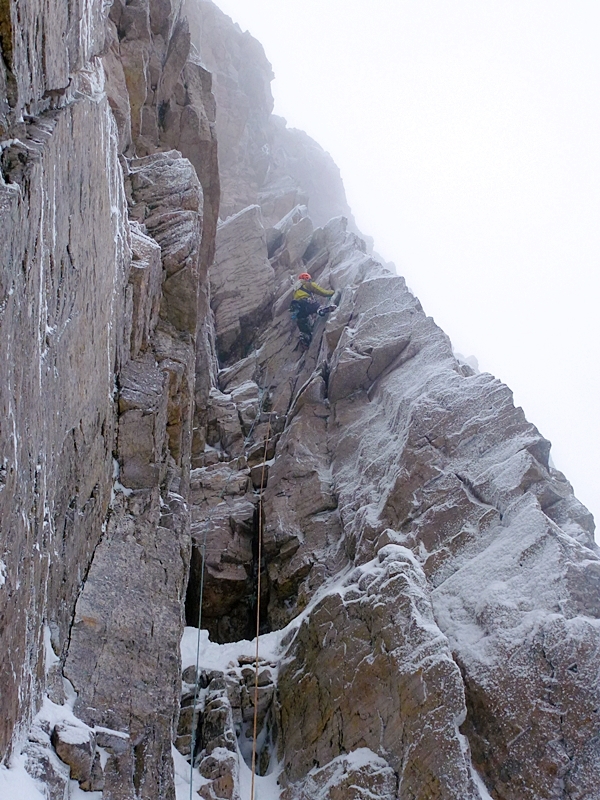 And the climbing, it just kept coming, which was following a wide and bulging crack line. A direct on Bruised Violet, culminating in two new long and quite serious pitches. Super sustained, burley and on occasion, rather emotional! 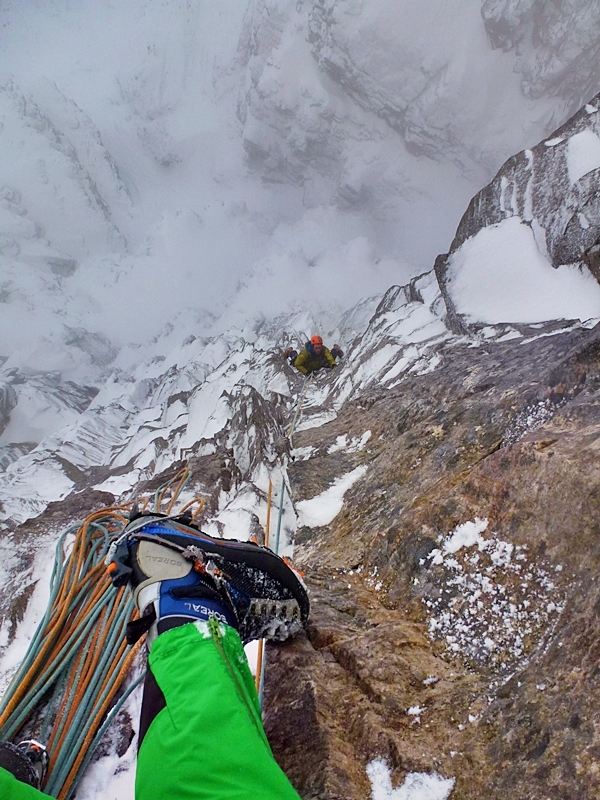 1 30m Chop Suey pitch 1. 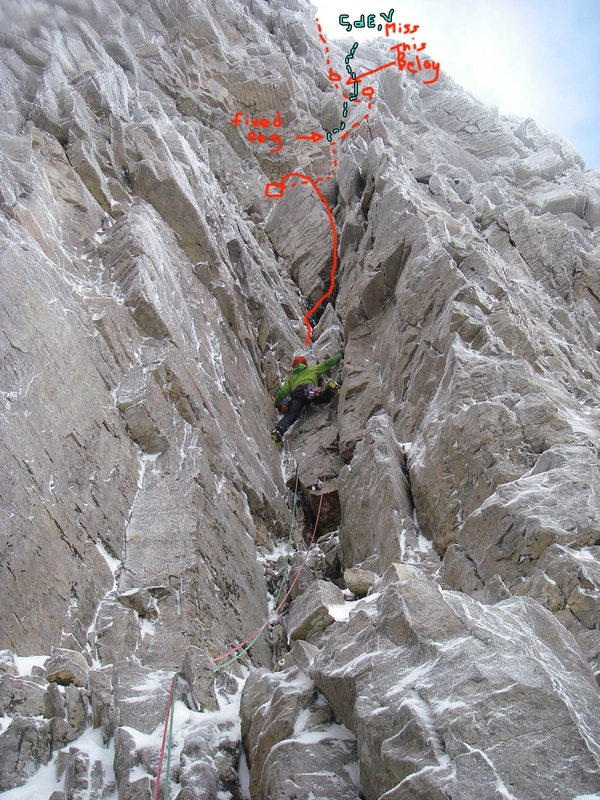 2 40m Climb cracks up the right wall of the groove (as for Chop Suey) to the upper girdle ledge then pull through the roof and follow the committing groove, (past in-situ pecker of BV,) where Bruised Violet goes hard right, continue direct until beneath a roof. Carefully pull right around the roof and climb the even more committing groove above without thinking about where the last piece of gear is or even what the last piece of gear was. At the top of the grove continue direct following the wide bulging crack line. 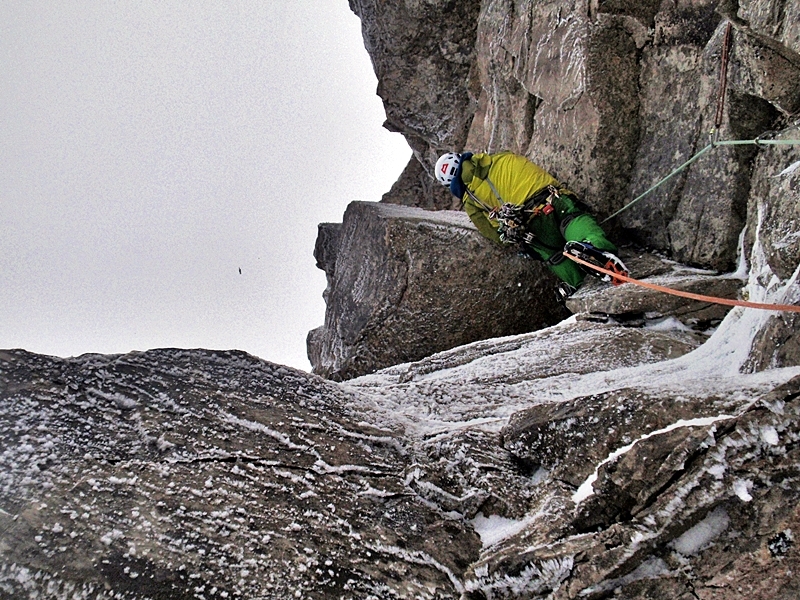 3 30m Climb direct to beneath an overhanging corner with a thin crack. Pull into the corner and climb it to the top to a rest and a wide crack. 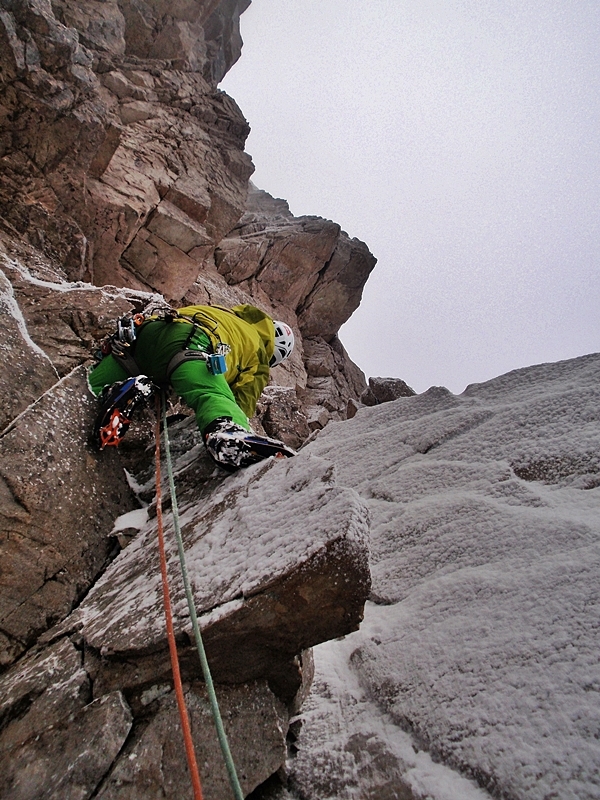 Climb a few moves right before continuing direct via small overhangs to the top. 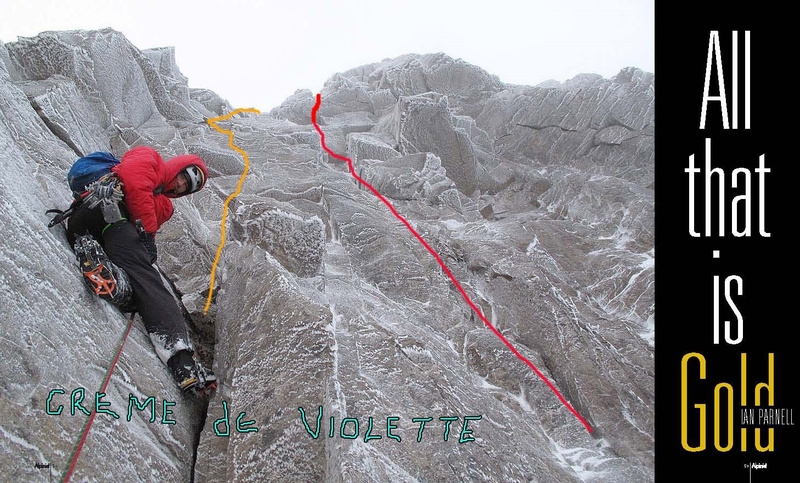 Ian Parnell’s topo from Bruised Violet, Crème de violette is the blue line. 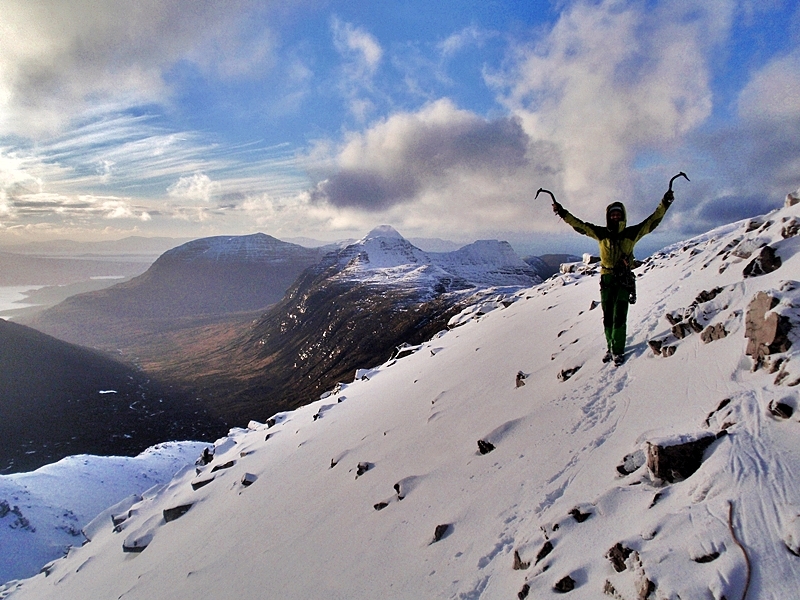 On Saturday I returned to Torridon with Katy Forrester and we climbed Mick Fowler’s Umbrella Falls on Liathach. We were thinking of Poacher’s Fall but so was everyone else and with loads of lines we couldn’t see the point of queuing … a rather pleasant and relaxing day after the previous day. Thanks to Tim Neill, Ian Parnell and Katy Forrester for the pics. 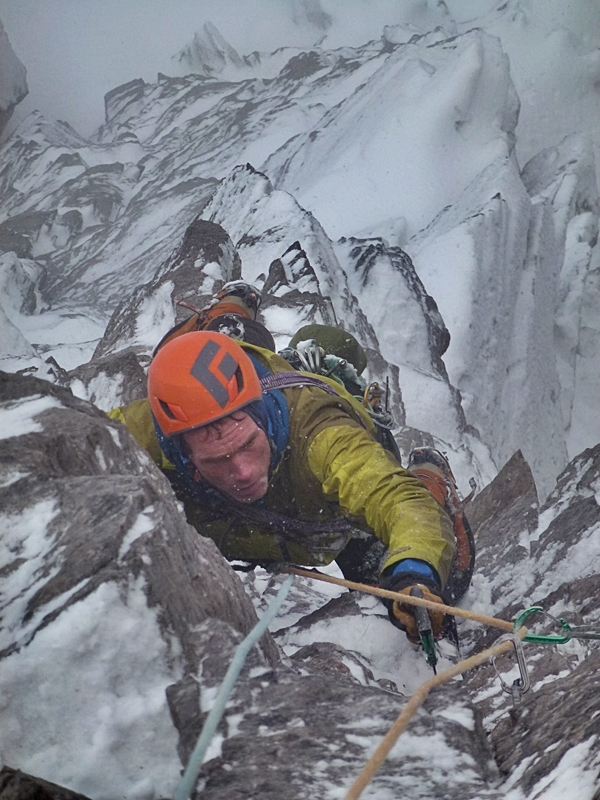 And thanks to Ian for the info and the Alpinist pic and the inspiration. 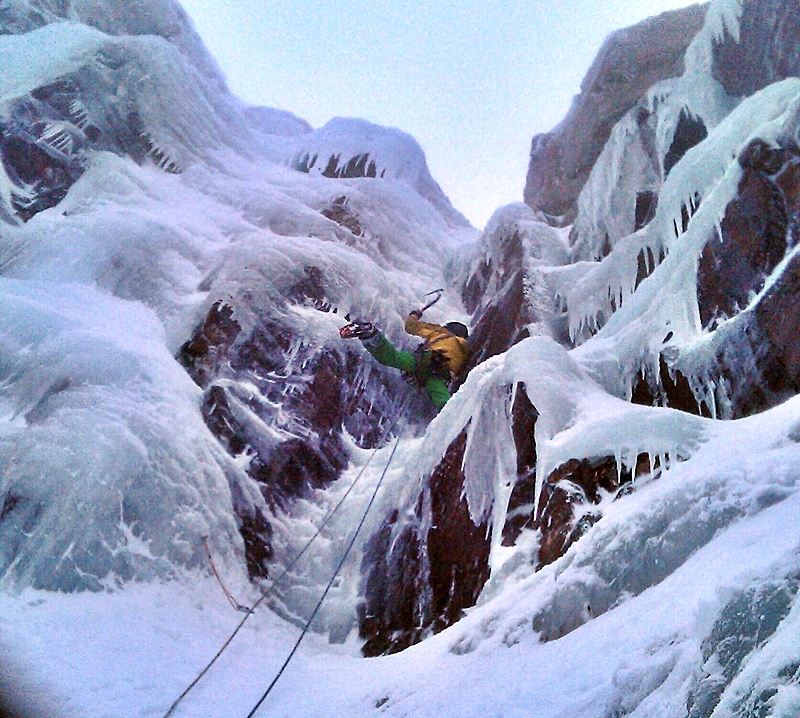 2 Responses to Northerlies… Creme de Violette (FA) and Umbrella Falls. These photos are absolutely incredible Nick!